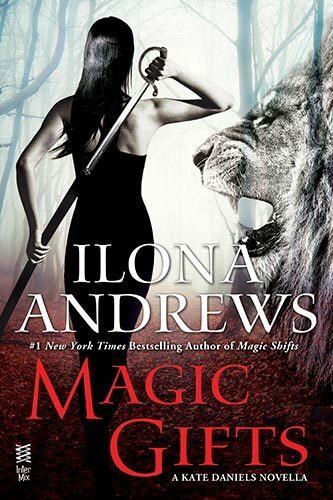 Originally this was a free gift to the fans, then it was released as part of GUNMETAL MAGIC, and now it's available individually to those of you who may not want to read Andrea's story in GUNMETAL MAGIC. Now available individually for the first time, a Kate Daniels novella from the#1 New York Times bestselling author of Magic Shifts and Gunmetal Magic. It isn’t often that Kate Daniels and the Beast Lord Curran get to take a breakfrom protecting their pack and enjoy some time for themselves. So when Curran offers Kate a romantic dinner in town, there’s no way she’s going to pass. But their quiet night doesn’t stay quiet for long. The trouble starts with a necromancer dying at a nearby table, continues with bloodthirsty vampires crashing though the windows, and ends with more blood on the walls than any dining establishment needs. Magic Gifts previously appeared in Gunmetal Magic.